Ca Limbo is an intriguing and inviting 6 bedroom family home, prominently situated within the exclusive and prestigious Sandy Lane Estate. There are four bedrooms in the main house with a separate two bedroom self contained cottage that features its own swimming pool. The villa encircles a large central pool onto which the three ground floor bedrooms and terrace open. Additionally there is a windward terrace – ideal for informal dining, a formal dining room next to the kitchen, a TV room and separate laundry and staff quarters which all complete this lovely property. Staff includes a housekeeper, cook and night watchman. The housekeeper and cook work from 8:30am to 1:30pm when they take a break until 5pm when they return for the evening service until 8pm. If the staff are asked to work after 8pm you are required to provide a taxi home for them. Your cook provides two meals a day for you, either breakfast and lunch, breakfast and dinner or lunch and dinner. Her day off is Saturday (Seventh Day Adventist). The staff only work one bank holiday over the Christmas period. Your stay at Ca Limbo includes access to the Sandy Lane Property Owners Beach Facility on the beautiful Sandy Lane beach. Ca Limbo is a short walk in to Holetown, the centre of our west coast, where you will find many options for shopping, dining, beach bars, nightlife, large supermarket, banks, cinema, wine store. 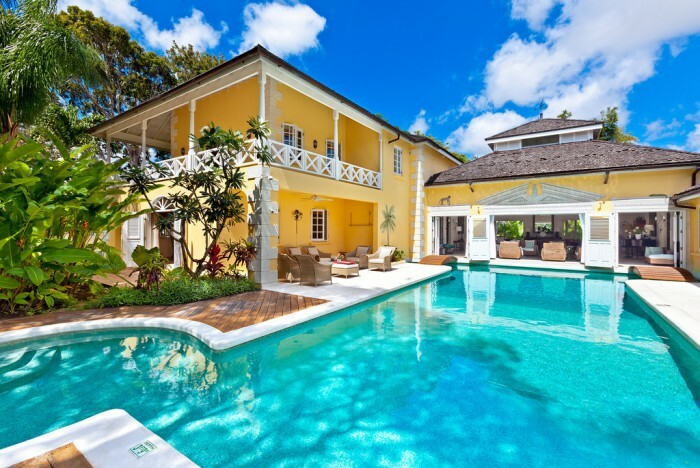 This luxury villa is located in a peaceful setting in the heart of the prestigious Sandy Lane Estate amidst lush tropical gardens and a short walk into Holetown and to the beach. Amenities include a private swimming pool and a beach facility with sun beds and cabana on Sandy Lane Beach.